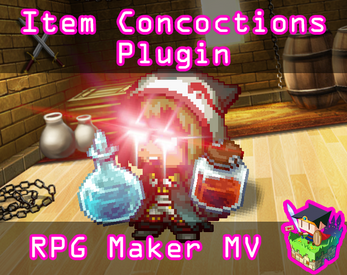 This is a RPG Maker MV plugin that adds a "Concoct" command to any actor you want in battle. Concoct allows the actor to combine together two items to make a new item effect. Concoctions will be composed of a primary component, secondary component, and a resulting effect. 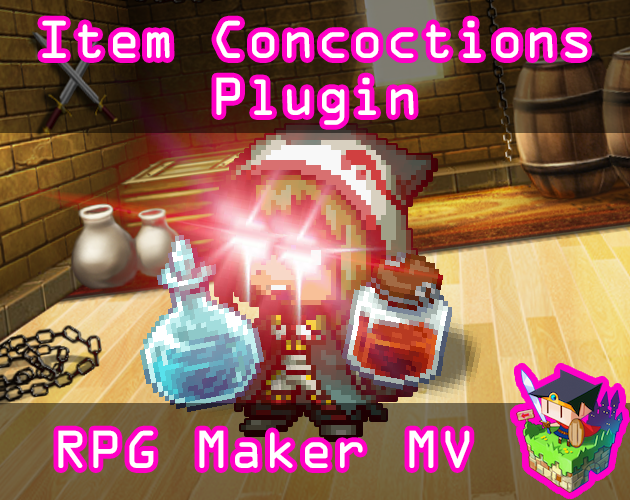 There is also an Item Concoction Preview Window that comes with this plugin. It can be enabled or disabled (up to you). It will display the resulting effect of the two mixed items together if the concoction combination has been made before. If it hasn't, the effects will be hidden. You can also find this plugin in action in the OctoPack Battler Sample Project. Included inside are 8 primary components, 8 secondary components, and 64 item combinations to result in! Concoct Command: How the command appears in the Actor Command list. Position: Where do you want to put the Concoct Command in the command list? 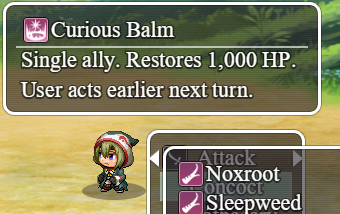 Preview Window: Add a preview window to the battle scene if true. Window Scale: Scale the size of the contents of the preview window down by this much. This is in case the contents of the window become too big. Window X, Y, Width: Changes the properties of the preview window. Set the setting to "auto" if you wish for the plugin to calculate the ideal position. Show Unknown Result? : If set to true, it will always show resulting effects of concoction combinations, even if they haven't been performed by the party yet. If set to false, the resulting effect will not be shown until the party has performed the combination at least once. Show Battle Test? : If this is true, always show unknown results during battle testing. Unknown Icon, Name, Help: How unknown results will appear. If an actor is affected by this notetag either directly or indirectly through related traits, the actor can use the Concoct command in battle. If an actor is affected by a state with this notetag, the actor's Concoct command will be disabled. Makes the item with the notetag a primary component for item concoctions. Insert multiple 'list' items to make it combinable with more items. If you are using Item x, replace x with the ID of the item you wish to refer to. If you are using a name version, replace name with the full name of the item (it is case sensitive). 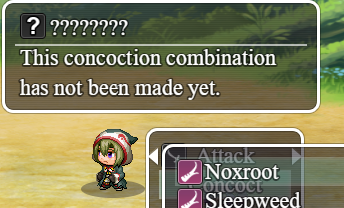 The first item on the list before the : is the secondary component for item concoctions. The second item on the list after the : is the item effect that will occur when the first and second components are combined. The effects of the first and second items are unrelated to the combined item effect. Concoctions will be composed of a primary component, secondary component, and a resulting effect. In this case, the primary component is the item with the notetag. The secondary component can be any of the items before the : in the list. The resulting effect is the item after the : next to the secondary component selected on the list. If you are using Boost Point System, Battle System OTB, or OctoBattle, place this plugin under those plugins in the plugin manager list. Sep 26 Bug Fix: Fix a bug where Concoct Menu returns. Sep 28 Bug Fix: Fix a bug where the notetags clashed.